Wakrays is proud to present this brand new Potting Bench. If you love to garden and plant flowers, vegetables and herbs, this is the perfect potting bench for you. Our wooden potting bench is made from solid fir wood construction and designed for durability. It has a natural wood finish that is perfect for those of you who love DIY painting (do-it-yourself). 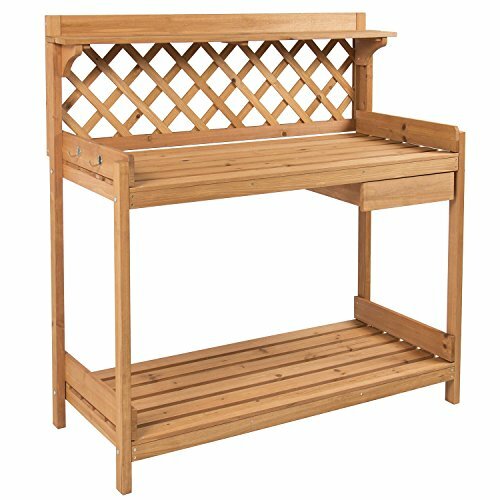 The potting bench comes with a side drawer that will hold your gardening tools as well as side hooks for easy tool hanging. It features a lower shelf and upper work station for easy soil access. It makes a great décor piece for your outdoor living area. We purchase our products directly from the manufacturer, so you know you're getting the best prices available. NEW PRODUCT WITH FACTORY PACKAGING If you love to garden and plant flowers, vegetables and herbs, this is the perfect potting bench for you. Our wooden potting bench is made from solid fir wood construction and designed for durability. It has a natural wood finish that is perfect for those of you who love DIY painting (do-it-yourself). The potting bench comes with a side drawer that will hold your gardening tools as well as side hooks for easy tool hanging. It features a lower shelf and upper work station for easy soil access. It makes a great décor piece for your outdoor living area. Overall dimensions: 45" (H) X 44" (W) X 20" (D) SPECIFICATIONS: Overall dimensions: 45" (H) X 44" (W) X 20" (D) Material: Chinese Fir Wood Assembly required Product Weight: Approx. 33 lbs Color: Natural Wood PLEASE NOTE: Our digital images are as accurate as possible. However, different monitors may cause colors to vary slightly. Some of our items are handcrafted and/or hand finished. Color can vary and slight imperfections in the metal work are normal and considered evidence of the hand-finishing process, which adds character and authenticity to those items. If you have any questions about this product by Wakrays, contact us by completing and submitting the form below. If you are looking for a specif part number, please include it with your message.